Click on thumbnails to view larger photos. Use back arrow to return. All photos by Joe Thompson unless otherwise credited. All rights reserved. 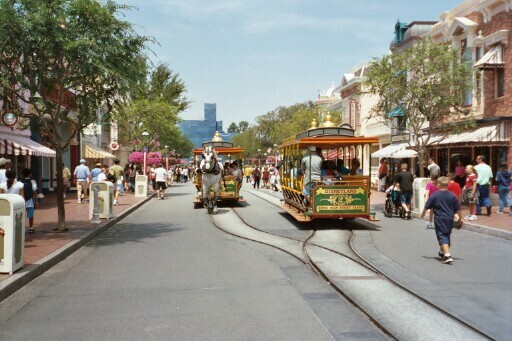 We visited Disneyland in July, 2002. After an absence of one year, we noticed many changes. 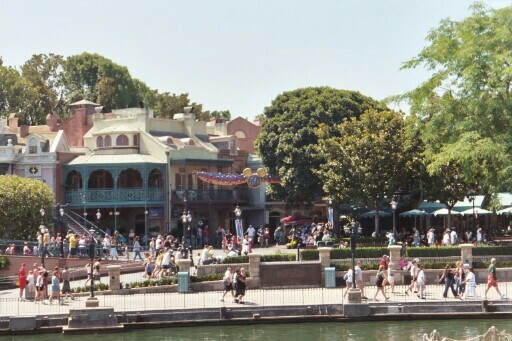 Cast members searched every purse and bag as people entered Disneyland and Disney's California Adventure. Small World was closed for renovation, which included the installation of gates in the boarding area. This seemed to be part of a broader effort to increase safety, or at least decrease liability. This included signs on virtually every ride warning people to remain seated and pay attention to their children, and announcements in multiple languages on rides besides Small World and the Matterhorn Bobsleds. We also noticed doors on the cars of Roger Rabbit's Car-Toon Spin. King Arthur's Carousel had been completely dismantled for renovation. 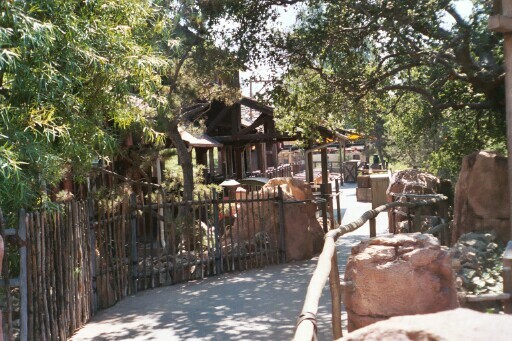 The Fort Wilderness area of Tom Sawyer's Island was roped off. The Country Bear Jamboree was gone, to be replaced by a new ride. 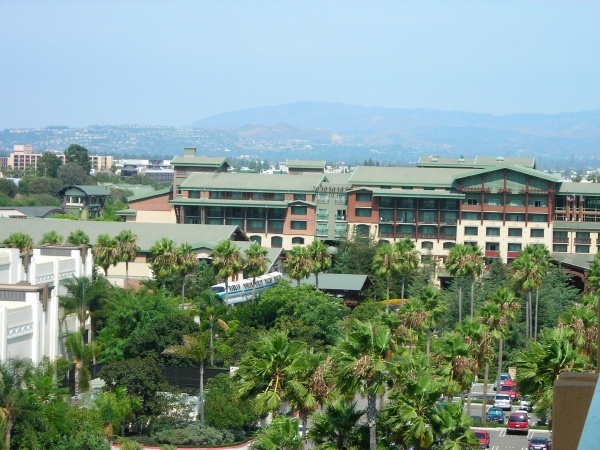 The red-orange double decker buses that had run among the three Disney resort hotels were not operating. The road they used near Downtown Disney was blocked by concrete barriers and parked vans. We saw and rode behind Disneyland Railroad locomotives 1, 3, and 4. 1 (CK Holliday) and 2 (EP Ripley) are 4-4-0s, built in 1955 by Disney's WED Enterprises in the Burbank studios. 3 (Fred Gurley) is a Baldwin locomotive, built in 1895 as an 0-4-4 and converted by Disney to a 2-4-4T in 1958. 4 (Ernest S Marsh) is a Baldwin locomotive, built in 1925 as an 0-4-0, and converted by Disney to a 2-4-0 in 1959. 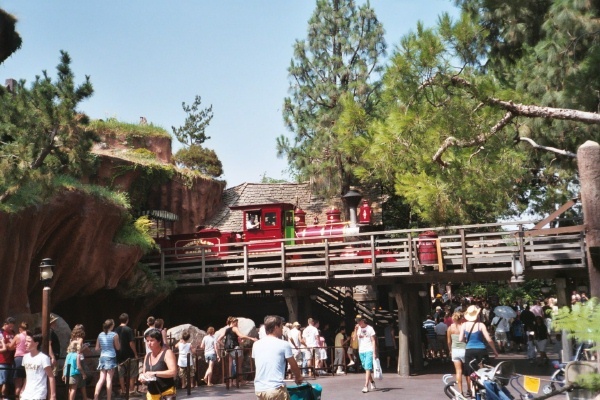 Disneyland locomotive 1, CK Holliday, crosses the road to Splash Mountain. July, 2002. 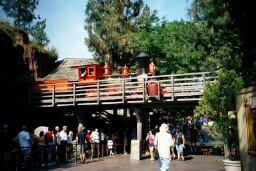 Disneyland locomotive 3, Fred Gurley, pauses at Toontown Station. July, 2002. 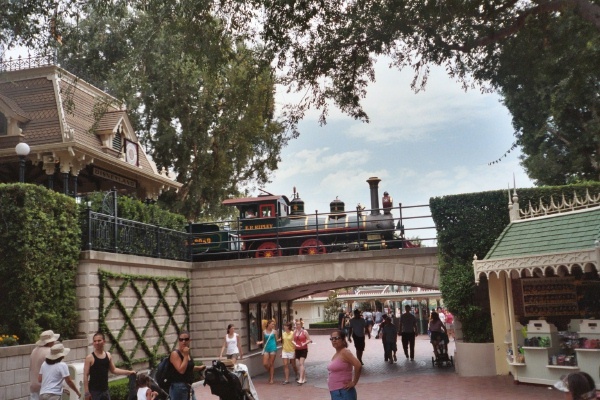 Disneyland locomotive 4, Ernest S Marsh, pauses at Main Street Station. July, 2002. Kalamazoo Manufacturing Company handcar parked on the old passing track at Main Street Station. July, 2002. 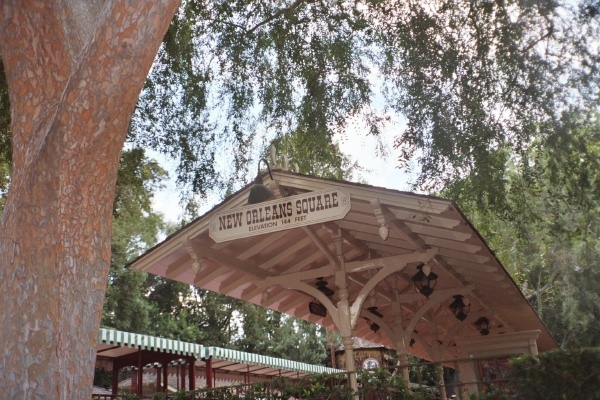 New Orleans Square Station, formerly Frontierland Station. July, 2002. 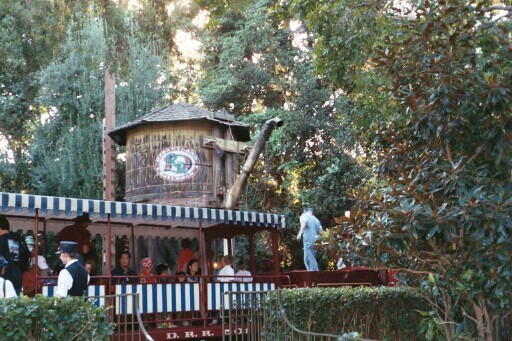 Trains use the water tank at Frontierland Station. 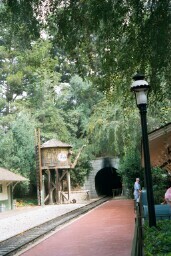 The tunnel leads to Splash Mountain and the Rivers of America. July, 2002. The Disneyland trainshed. Trains use the lower level and monorails the upper. July, 2002. 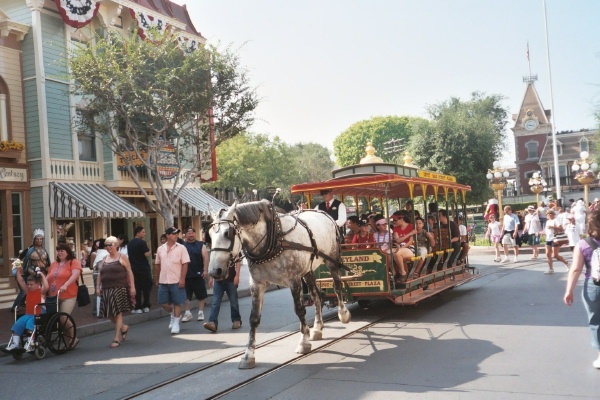 Disneyland's fleet of four Horse-Drawn Streetcars has operated since opening day in 1955. The line starts at a balloon loop in front of Main Street Station. 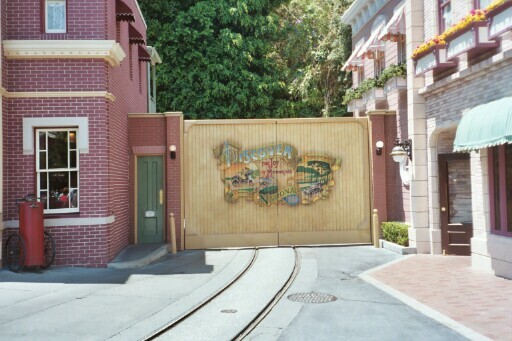 Cars go into and out of service on a track which disappears through a gate between the firehouse and the Main Street Emporium. A single track runs the length of Main Street, with an automatic passing loop in the middle. The line ends at a loop in front of Sleeping Beauty's Castle. The beautiful horses obviously enjoy the work. 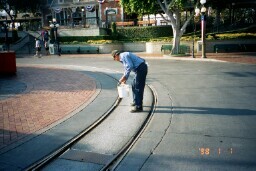 Just after opening, a Disneyland cast member greases the curve in front of Main Street station to reduce squealing. July, 2002. 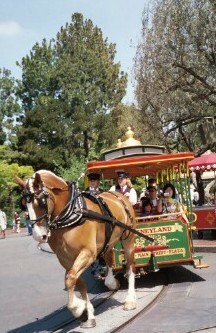 A Disneyland horse car pulls into service just after opening. 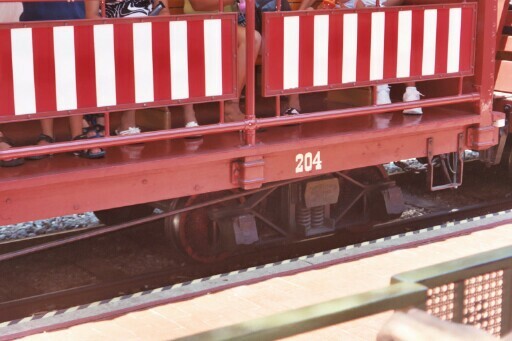 July, 2002.
horse car 4 lays over at Main Street Station. July, 2002. 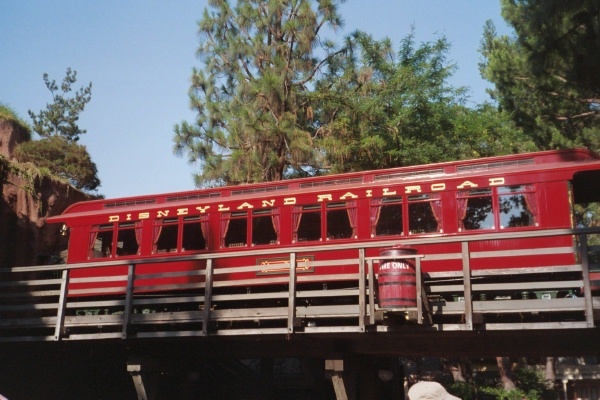 Another view of horse car 4 laying over at Main Street Station. 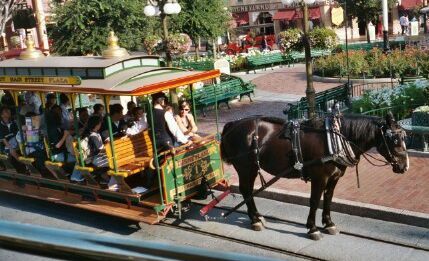 July, 2002.
horse car 4 entering the loop at Main Street Station. July, 2002. 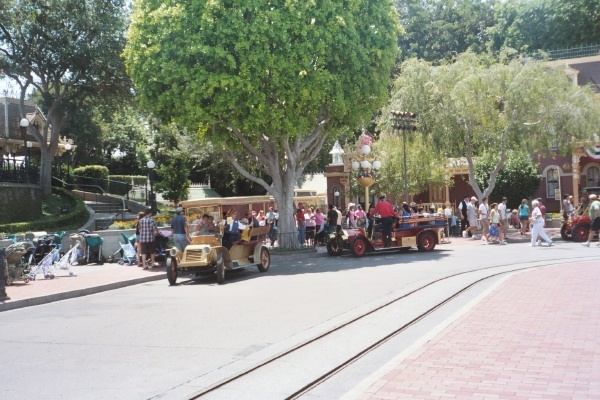 Various rubber-tired vehicles help the horse cars haul guests up and down Main Street. My favorite is the double decker bus. I don't know why the signs at the terminals identify it as an "Omnibus". The double decker bus loads a group of passengers for a one-way trip up Main Street. July, 2002. 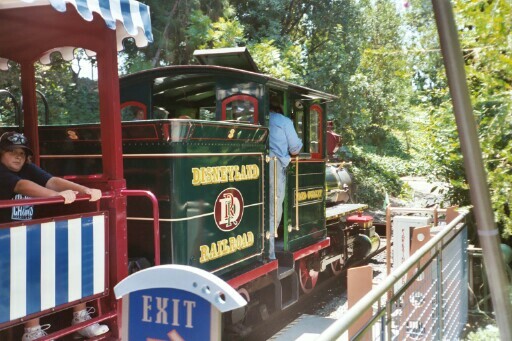 The Casey Jr Circus Train uses an internal combustion engine in the calliope car behind the locomotive to haul guests through a lovely trip around Storybook Land. The steepest hill uses a roller coaster-style chain. We try to ride it every trip. Casey Junior pulls into the station. July, 2002. 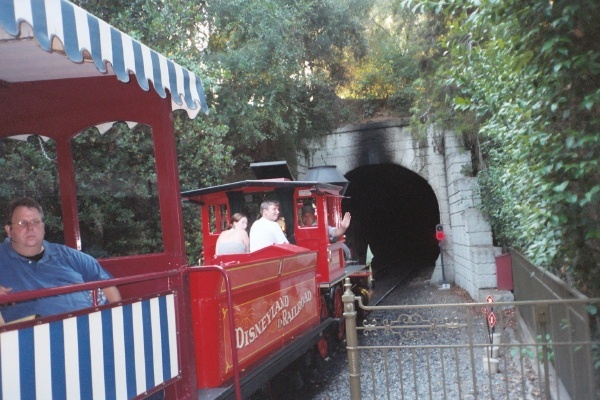 The Mine Train Through Nature's Wonderland used battery-powered locomotives to haul guests through scenes inspired by Disney's "True Life Adventure" movies. 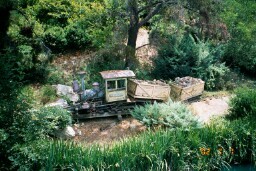 When the ride was replaced by the Big Thunder Mountain roller coaster, which recycled some of the scenery and Audio Animatronic animals, one trainset was set up to represent a wrecked train along the Rivers of America. 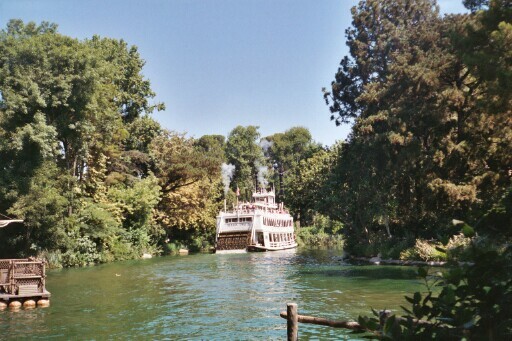 A train from the old Nature's Wonderland ride is visible along the Rivers of America. July, 2002. 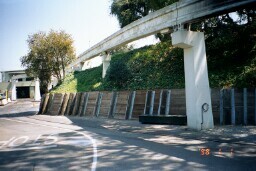 Monorails using the German Alweg system have operated around Disneyland since 1959. 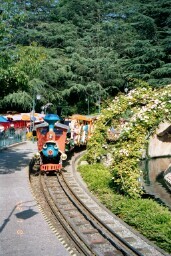 The current trains are called Mark V. Marks I-III operated at Disneyland. Mark IV trains operate at Disney World in Florida. 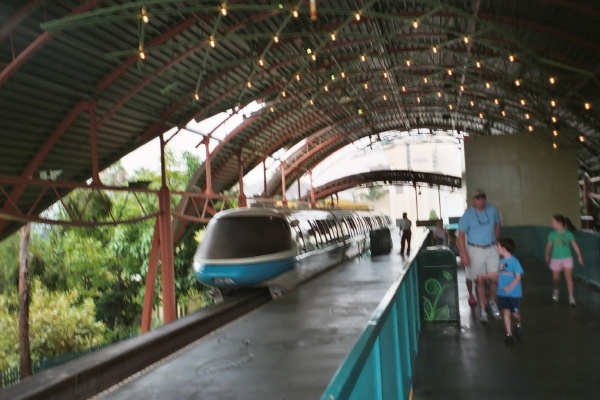 Monorails are replaced fairly frequently because they are lightly built. 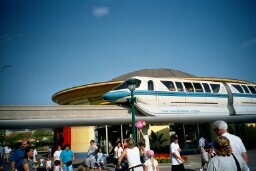 The blue Mark V monorail crosses near the Lego Store, on its way to the Downtown Disney station. July, 2002. 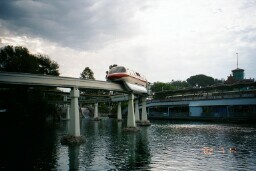 The red Mark V monorail crosses the former Submarine Lagoon on its way to the Tomorrowland station. July, 2002. 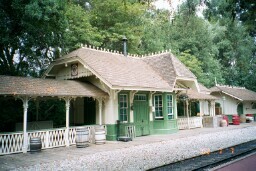 If you want to learn more about railroads at Disneyland, look for Michael Broggie's book Walt Disney's Railroad Story. Disneyland locomotive 3, Fred Gurley, pauses at Main Street Station. July, 2003. 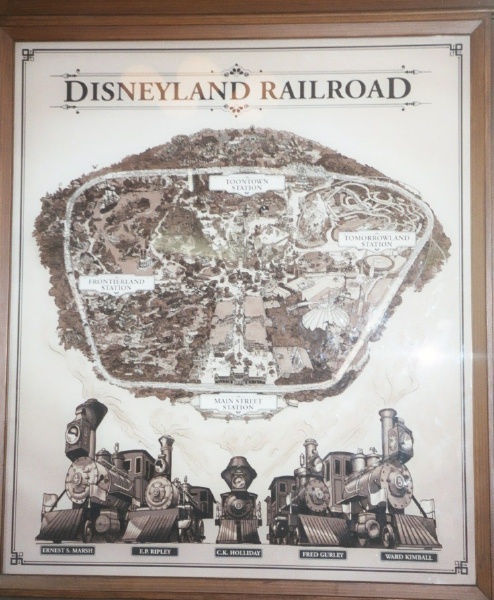 A map of the Disneyland Railroad, in Main Street Station, displays the positions of the trains on the line. July, 2003. 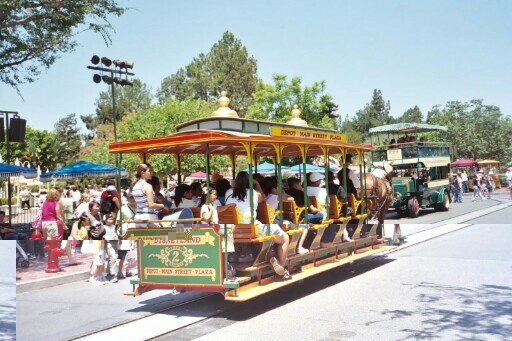 We visited Disneyland in July, 2003. Cast members still search every purse and bag as people enter Disneyland and Disney's California Adventure. Small World was open after renovation last year. The cast members had trouble getting people to stand back so the gates could close. I didn't notice anything new in the ride, but it looked cleaner. King Arthur's Carousel was also open after being rebuilt. The horses looked nice and shiny. The new Winnie the Pooh ride, which replaced the Country Bear Jamboree, was open, but kept breaking down. Splash Mountain and Indiana Jones also went down several times while we were there. Pirates of the Caribbean seemed to go out of service more frequently than I remember. The Winnie the Pooh ride is new, so perhaps the problems are understandable. The ride itself is a dark ride, with cars that follow a guide rail, like Snow White. Space Mountain is closed until 2005. 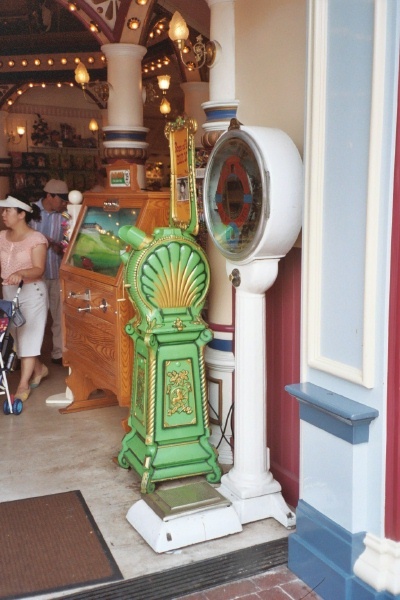 I didn't get to investigate, but they seem to have removed the Mutoscopes from the arcade on Main Street. The red-orange double decker buses that had run among the three Disney resort hotels were still not operating. The road they used near Downtown Disney was still blocked by concrete barriers and parked vans. We saw trains pulled by locomotives 1 (CK Holliday), 2 (EP Ripley), and 3 (Fred Gurley) (see 2002 for details about the locomotives) . I did not see 4 (Ernest S Marsh). Last year, I did not see 2. 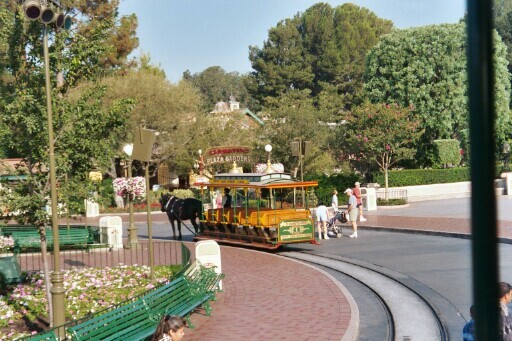 Disneyland horse car turns into Main Street after laying over at the Plaza. July, 2003. 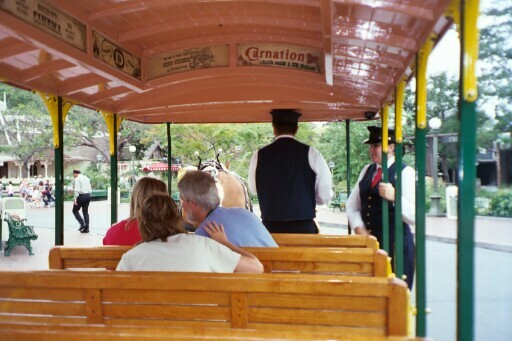 Interior of a Disneyland horse car as it circles the Plaza. July, 2003. 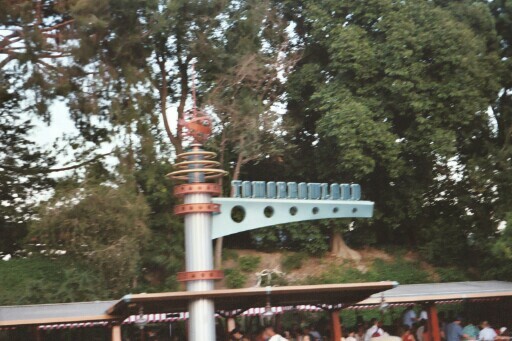 Disneyland red Monorail crosses Fantasyland. July, 2003. 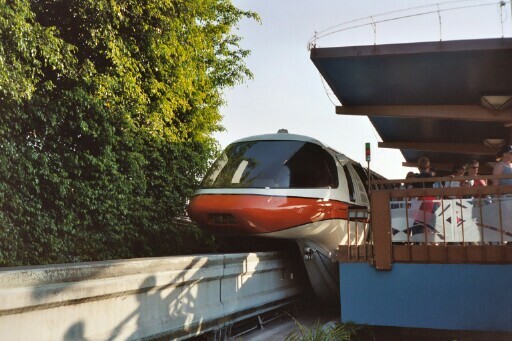 Disneyland orange Monorail at Tomorrowland Station. July, 2003. 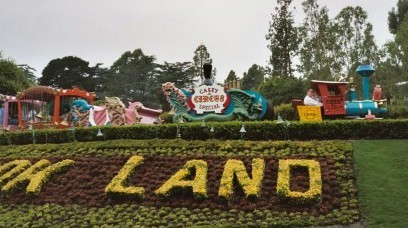 Casey Junior Circus Train above the Storybook Land sign. July, 2003. Big Thunder roller coaster train pulls into the station. July, 2003. Front view of structure in the form of the California Zephyr at Disney's California Adventure. July, 2003. 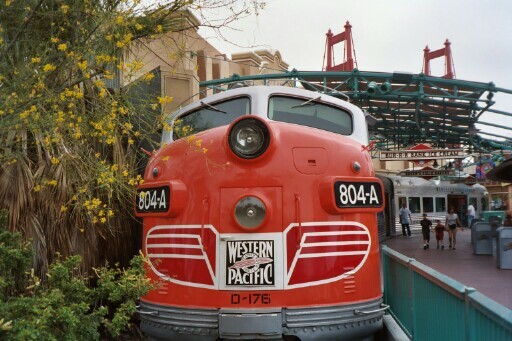 Rear view of structure in the form of the California Zephyr at Disney's California Adventure. July, 2003. 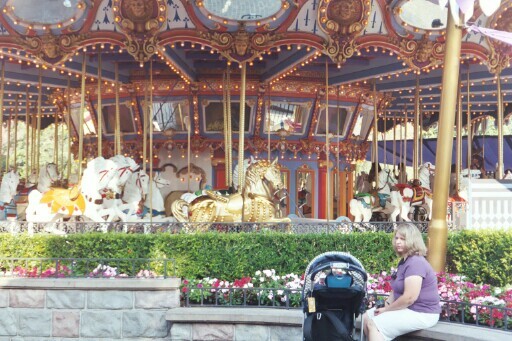 We visited Disneyland in August, 2004. It was very hot. Engine 4 pulls into New Orleans Square in the late afternoon. August, 2004. 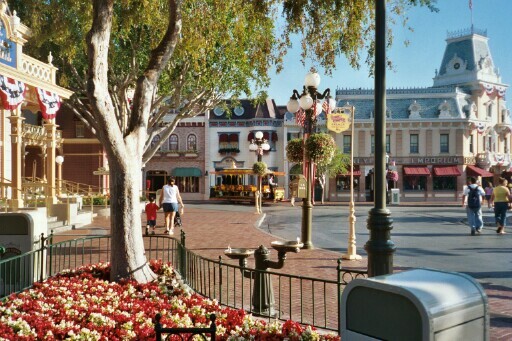 In 2002 and 2003, cast members had searched every purse and bag at tables right in front of the gates as people entered Disneyland and Disney's California Adventure. This year, there were tents set up at the entrances to the plaza between the two parks. Each contained three folding tables, where cast members did their searches. It seemed a little more efficient than the previous method. 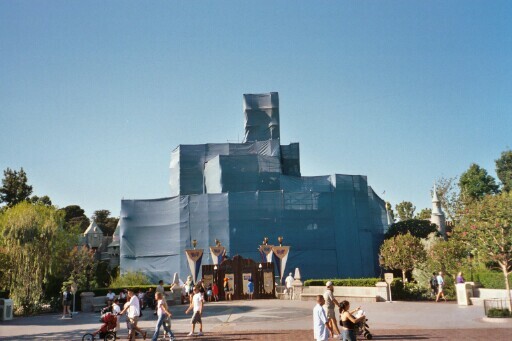 Sleeping Beauty's castle wrapped while it was being redecorated for Disneyland's 50th birthday. August, 2004. 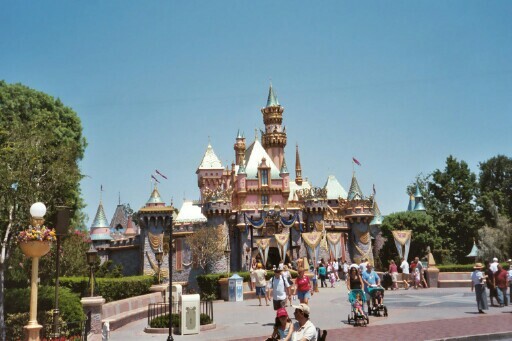 Disneyland will celebrate its 50th birthday in 2005. There were many preparations going on, the most notable of which was that the castle was surrounded by scaffolding and blue tarps. The family was disappointed. A fence out front had before and after pictures. After is going to be gaudy. The land side of the River Belle Terrace was wrapped up when we got there, but the scaffolding came down after a couple of days. 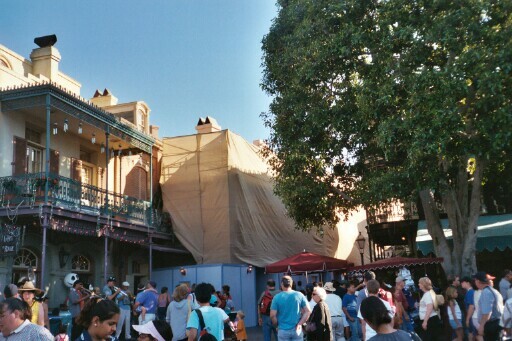 In New Orleans Square, the side of the street where the Pirates' exit and the Blue Bayou are located was wrapped up. Naturally, there were many 50th birthday souvenirs on sale. 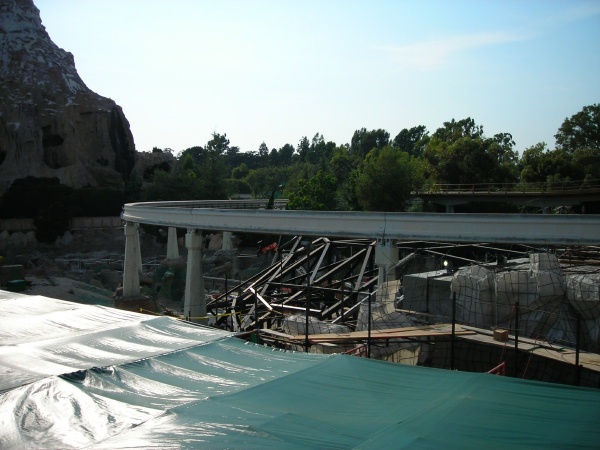 The street by the exit from the Pirates, also wrapped for touching up. August, 2004. The engineer waves as locomotive 4 pulls into New Orleans Square. August, 2004. The fireman prepares to give locomotive 4 a drink at New Orleans Square. August, 2004. We saw trains pulled by locomotives 2 (EP Ripley), 3 (Fred Gurley), and 4 (Ernest S Marsh) (see 2002 for details about the locomotives). I did not see 1 (CK Holliday). Last year, I did not see 4. Big Thunder Mountain trains sit in the station during testing. August, 2004. 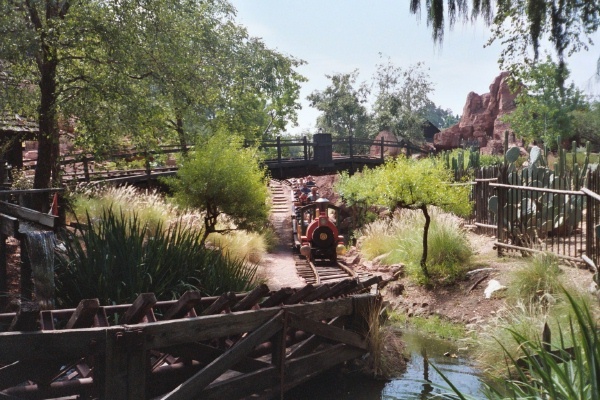 The Big Thunder Mountain roller coaster was shut down, after a fatal accident in April and a less-serious accident earlier in the summer. The area next to the roller coaster was very quiet. Cast members were testing the roller coaster on Monday. 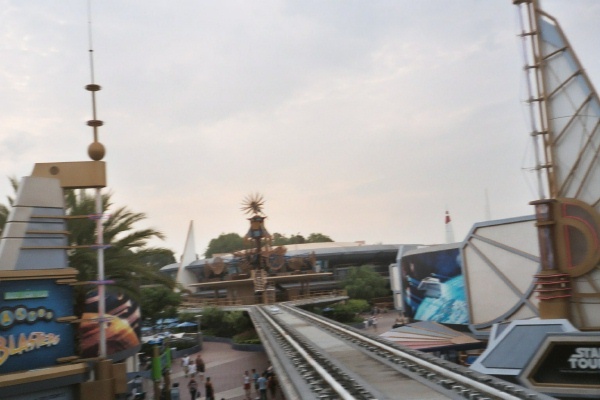 The Space Mountain roller coaster was closed for the third summer. It is due to open in 2005. Having both these coasters out of service was disappointing. The Tiki Room was also fenced in; it is supposed to reopen in 2005. 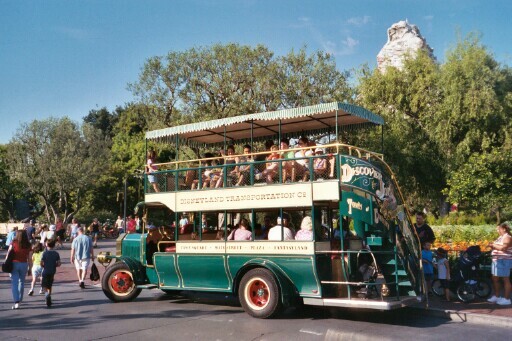 The double decker bus at the Plaza, with the Matterhorn in the background. August, 2004. I had a good time riding on and watching the horse cars. They had revived the petting zoo at Big Thunder Ranch, and one of the tall Belgian horses was on display, but not for petting. 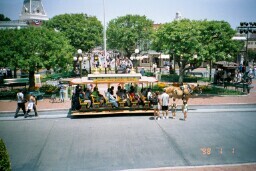 horse car 1 in front of Main Street Station, seen from the double decker bus. August, 2004. Moments later, horse car 1 leaves for the Plaza. 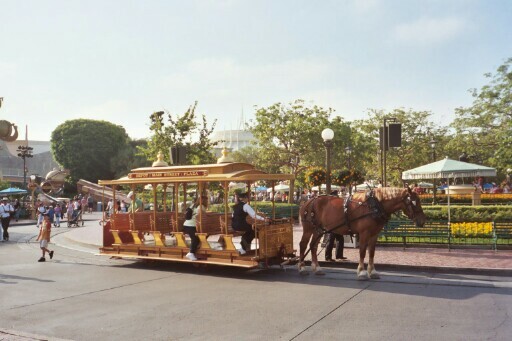 August, 2004.
horse car 1 lays over at the other end of its trip, the Plaza. August, 2004.
horse car 2 at the train station. Belgian horse Chip waits for another trip up Main Street. August, 2004. 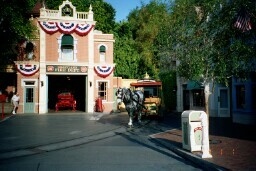 A horse car pulls into service just after the park opens. 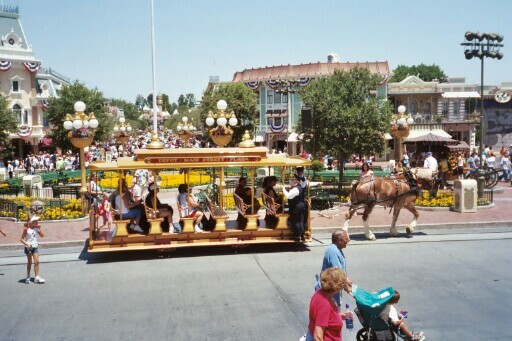 August, 2004.
horse car 1 rolls up Main Street, towards the Plaza and the wrapped castle. 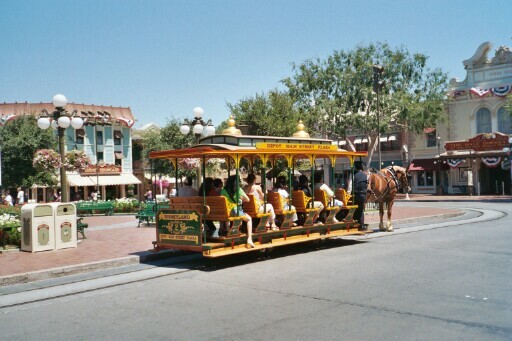 August, 2004.
horse cars 1 and 2 in the passing loop on Main Street. August, 2004. I saw the monorail wrecker out one afternoon, doing some kind of work along the line. 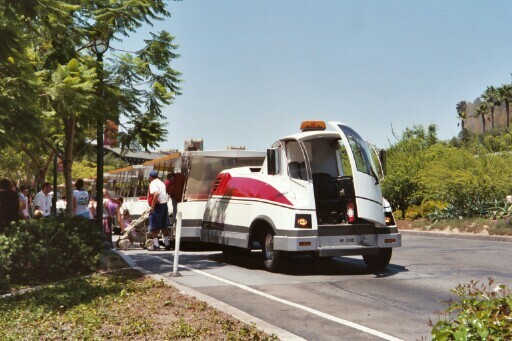 The monorail wrecker pulls out of the Downtown Disney station during a stoppage. August, 2004. 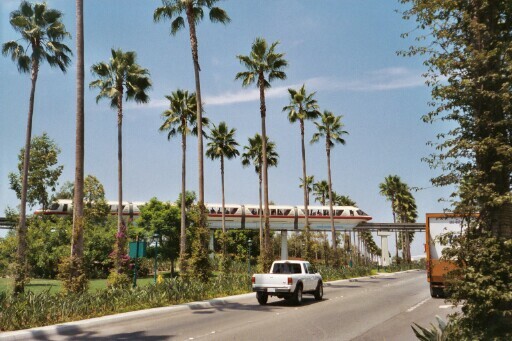 The red monorail crosses Disney Way after leaving the Downtown Disney station. August, 2004. There were three Mutoscopes in the arcade. I hadn't seen any in 2003. 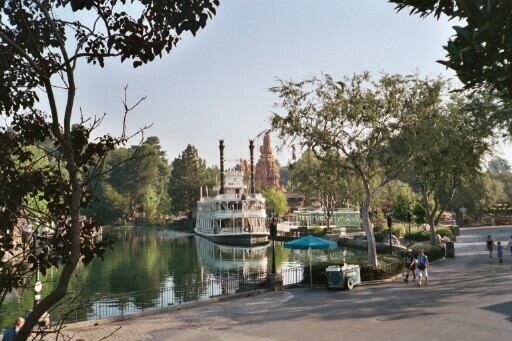 Sternwheel steamboat Mark Twain at the landing in Frontierland. August, 2004. Sternwheel steamboat Mark Twain rounds the far end of Tom Sawyer's Island. August, 2004. We visited Disneyland in July, 2005. It was hot and muggy and very crowded every day. A gold teacup on the Mad Hatter's Tea Party. A teacup intended for posing was also gold. My wife noticed that many people who sat in it didn't want to move. 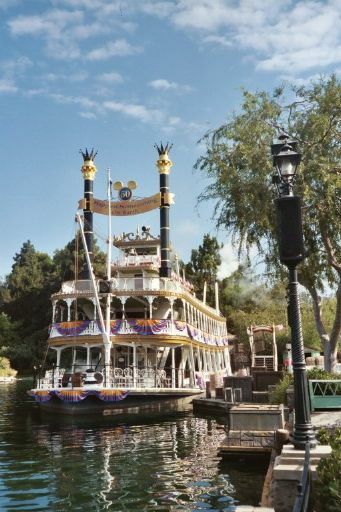 A gold Storybook Land Canal Boat. It was out of service with engine trouble. They painted the columns flanking the entrance to Snow White's Scary Adventure. 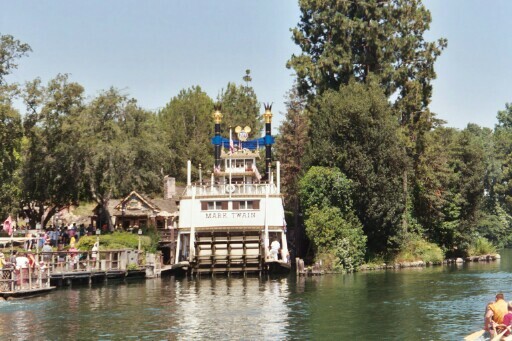 They also decorated the Mark Twain. 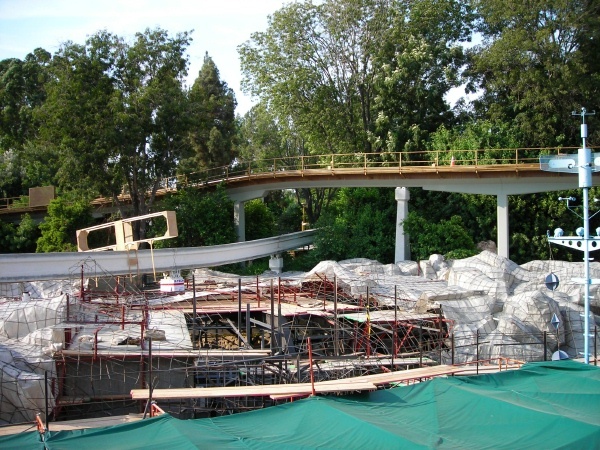 The golden horse car, Number 4, lays over near Tomorrowland. July, 2005. A broadside view of the golden horse car, Number 4. July, 2005. 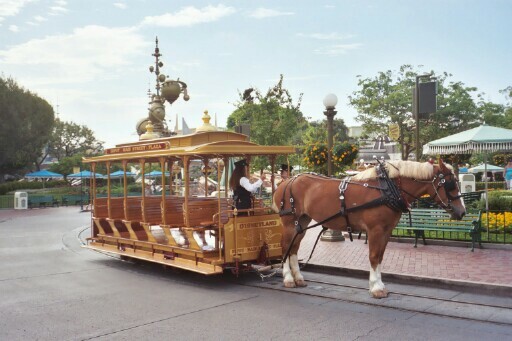 The golden horse car, Number 4, lays over by Main Street Station. 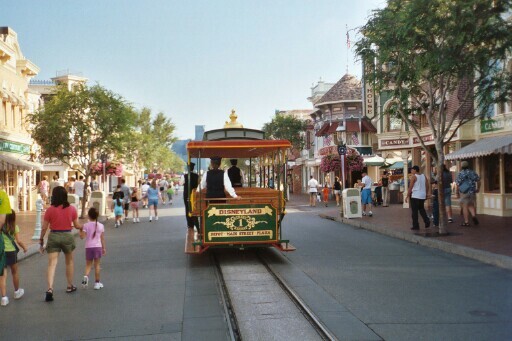 July, 2005.
horse car 2 heads towards Main Street. July, 2005.
horse cars head in and out of service through this gate next to the Fire House. July, 2005. 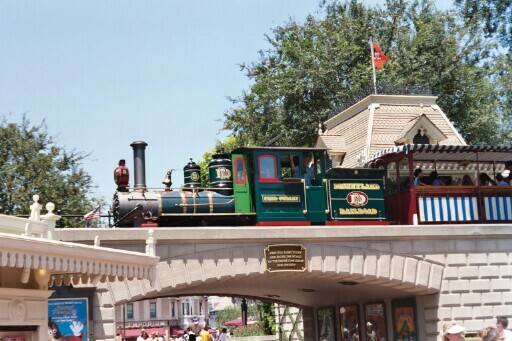 Disneyland had introduced a new locomotive, Number 5, the Ward Kimball, on 25-June-2005. Ward Kimball, who passed away in 2002, was a Disney animator and railfan. He designed the gold Jiminy Crickets on the sides of the headlight. Number 5, a 2-4-4T, was built by Baldwin in 1902 as an 0-4-4T for a plantation railroad in Louisiana. 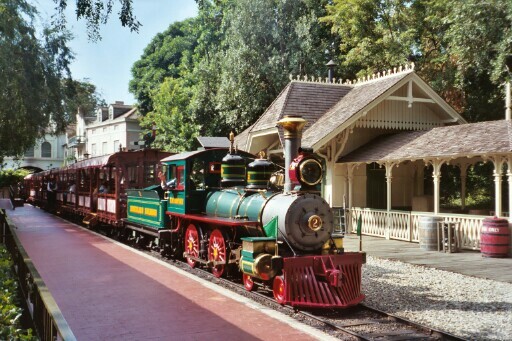 This was Disneyland's first new locomotive since 1959. Disney acquired Number 5 in a trade with Cedar Point, an amusement park in Ohio, where it had operated as Number 1, the Maud L, from 1963 to the early 1990's. Cedar Point had added the leading wheels. 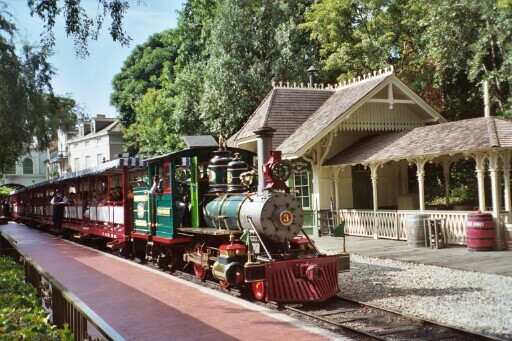 In return, Cedar Point received the first Ward Kimball, a Davenport 2-4-4T which Disney had intended to operate on the Disneyland Railroad, but which proved to be too heavy for the bridge at Critter Country. 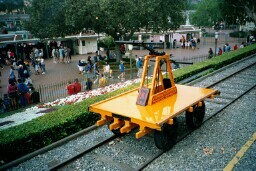 The locomotive went to Walt Disney World in Florida, where it proved to be too light (!). The new Ward Kimball sat in storage until 2004, when restoration began at Boschan Boiler & Restorations. Unfortunately, Number 5 did not operate during the week I was there. The railroad was closed from December, 2004 to 17-March-2005 for refurbishment, including new ballast and new block signals. The most noticable feature of the new signals is that the green lights, at least those at the stations flashed when it was safe for the train to proceed. 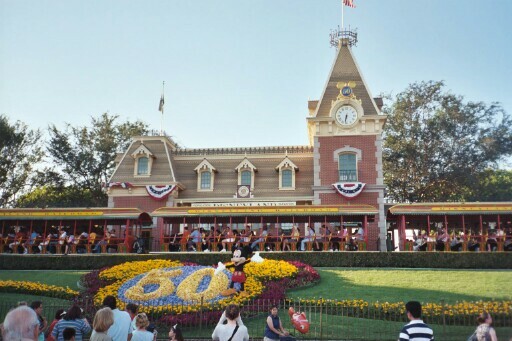 A train at Main Street Station, with Fiftieth Anniversary decorations. July, 2005. 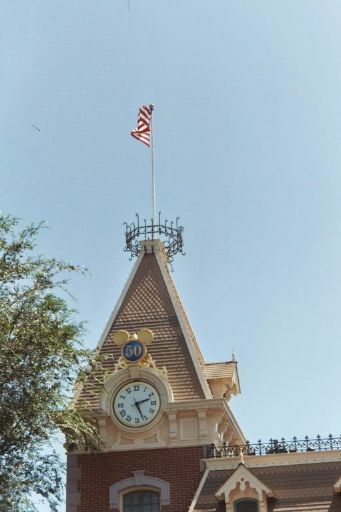 The Main Street Station tower, with Fiftieth Anniversary decorations. July, 2005. 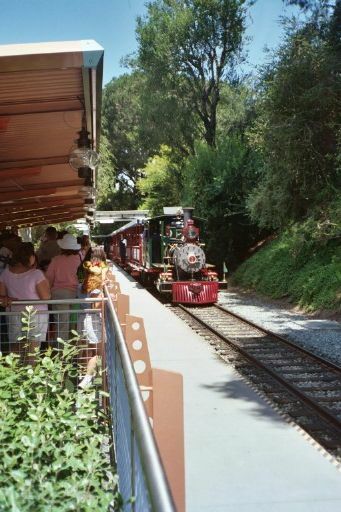 Locomotive 2 pulls a train into New Orleans Square Station. July, 2005. 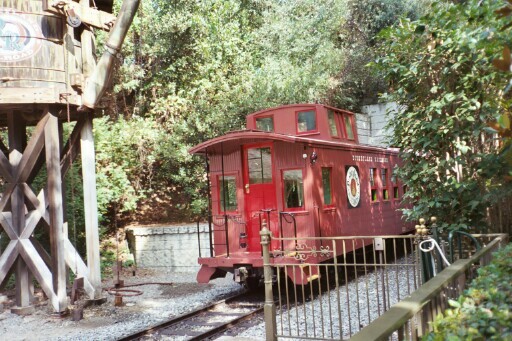 Disneyland Railroad's caboose leaving New Orleans Square Station. July, 2005. 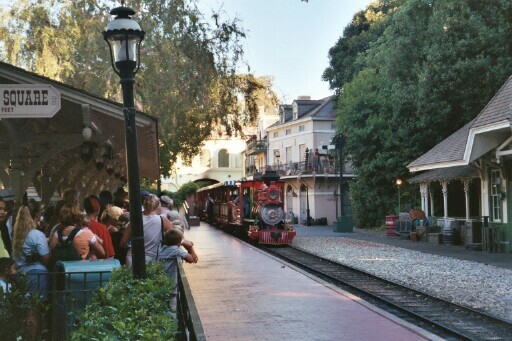 Locomotive 3 pulls a train into New Orleans Square Station. July, 2005. 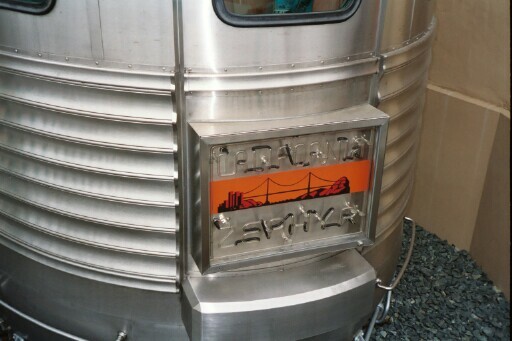 A detail view of one of car 204's trucks. July, 2005. 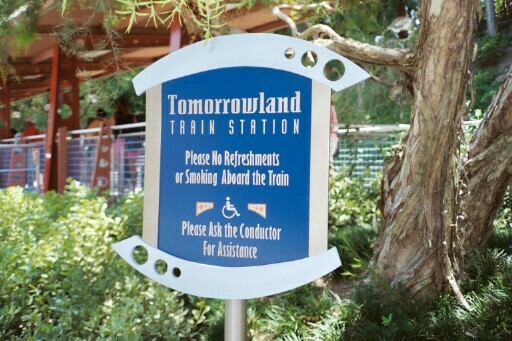 The Tomorrowland Station sign. July, 2005. An information sign at Tomorrowland Station. July, 2005. Locomotive 3 pulls a train into Tomorrowland Station. July, 2005. Locomotive 3 waits at Tomorrowland Station. July, 2005. 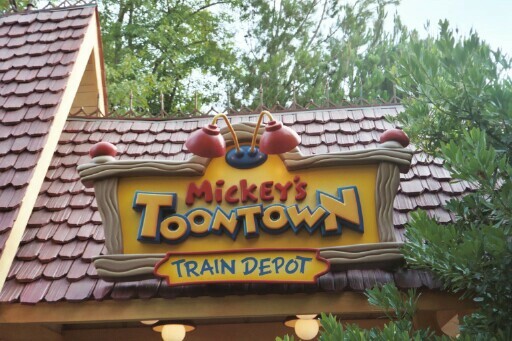 The Toontown Station sign. July, 2005. 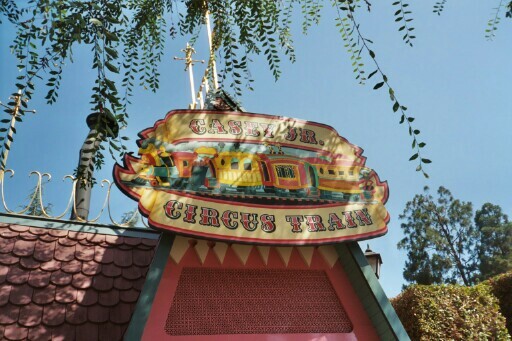 The sign at Casey Jr's Circus Train. July, 2005. 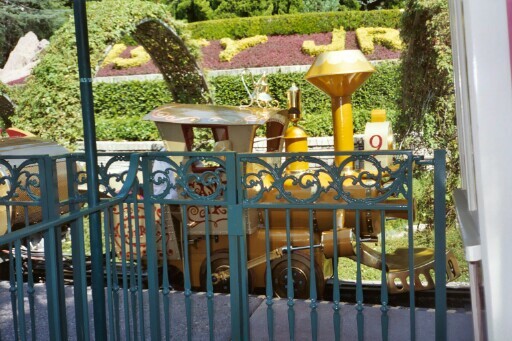 The golden locomotive at Casey Jr's Circus Train. July, 2005. We saw trains pulled by locomotives 1 (CK Holliday), 2 (EP Ripley), and 3 (Fred Gurley) (see 2002 for details about the locomotives). I did not see 4 (Ernest S Marsh) or 5 (Ward Kimball). 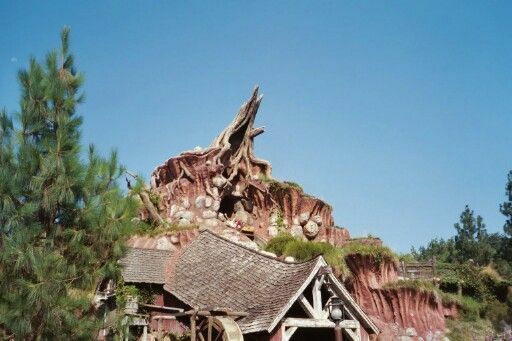 The Big Thunder Mountain roller coaster was back in operation after being shut down twice in 2004. The Space Mountain roller coaster was finally open; the family enjoyed the ride. The Tiki Room was also open; the seats are now benches rather than individual chairs. There was a new ride, Buzz Lightyear's Astro Blasters, in the former queue area for Rocket Rods. It was a dark ride with cars that the riders could spin. Two riders in each car competed to shoot at targets. It was fun and very competitive. Great Moments with Mr. Lincoln was gone. In the lobby there was a large display on Disneyland's history, including Herb Ryman's concept drawing, and a model of the park as it appeared on opening day. In the theatre, there was a movie called "Disneyland: The First 50 Magical Years", which was hosted by former cast member, Steve Martin. 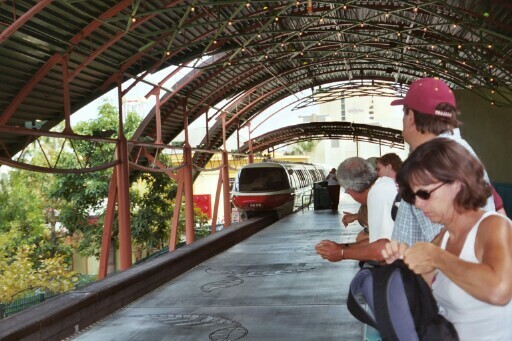 The red Mark V monorail rolls into Downtown Disney Station. July, 2005. The purple Mark V monorail crosses the drained Submarine Lagoon. July, 2005. The drained Submarine Lagoon from a monorail. The submarine rail is covered. July, 2005. The Submarine Lagoon was surrounded by fences. Passing over on the monorail, we could see that the area was being cleaned out. 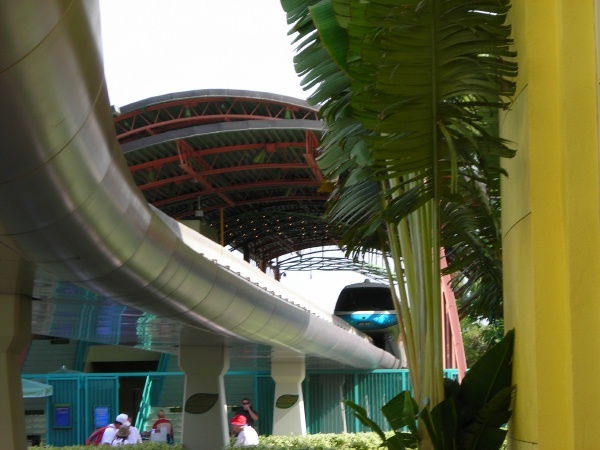 The rails were still there, and will probably be retained or replaced for the new Finding Nemo submarine ride. The revised fireworks show makes heavy use of projections. It uses sounds and images from many rides. We enjoyed watching it in front of Small World. 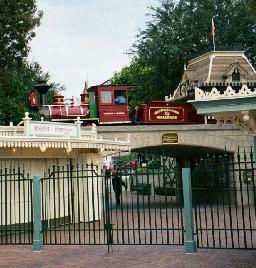 The locomotive crews tried to leave Toontown Station at the same time as the show covered the railroad. The fireworks were launched from many parts of the park. The fireworks were cancelled three times in seven nights because of wind, perhaps because of the many new launch locations. One night, we were able to watch Fantasmic and the fireworks from the balcony next to the Disney Gallery. It was a much nicer experience than watching Fantasmic from among the crowd on the ground. The $47.00 tickets included a dessert buffet and all we could drink. The only problem with all we could drink was that there is no restroom in the Disney Gallery. Another night, we were in line to ride Small World just before the fireworks show. Just before we boarded the boat, the ride stopped. A team of electricians walked into the ride and cast members began to evacuate guests. I felt sorry for the people who had to sit there for some minutes before the music stopped. To add insult to injury, the fireworks were cancelled that evening. Riverboat Mark Twain, decorated for the Fiftieth Anniversary, at the New Orleans Square landing. July, 2005. Riverboat Mark Twain, laid up with a paddlewheel problem. July, 2005. 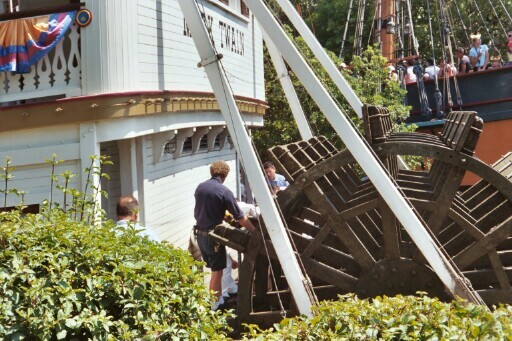 Cast members try to repair the paddlewheel problem. Columbia sails by in the background. July, 2005. 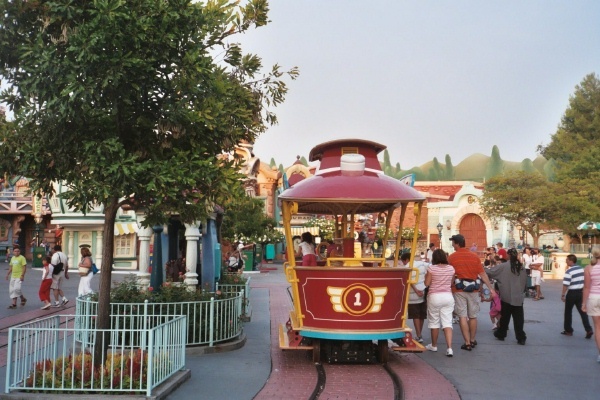 In Toontown, the place where the Jolly Trolley does not stop. July, 2005. 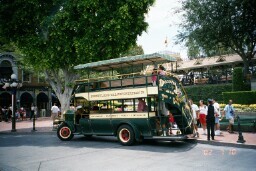 We didn't visit Toontown much, but I didn't see the Jolly Trolley operating. 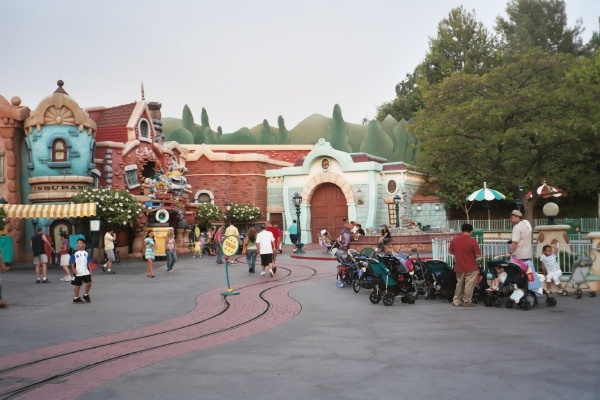 One day while we waited in line for Roger Rabbit's Car Toon Spin, we heard an operator remark that one of the trolleys was missing from the car barn. The gas lamps along Main Street were decorated for the Fiftieth anniversary. July, 2005. Sleeping Beauty's Castle decorated for the Fiftieth anniversary. July, 2005. New Orleans Square decorated for the Fiftieth anniversary. July, 2005. The golden horse on the Carousel. July, 2005. 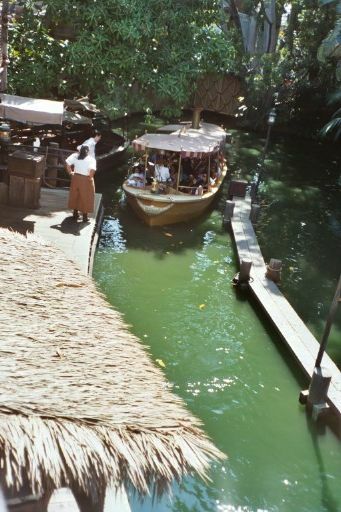 The golden Jungle Cruise boat. July, 2005. 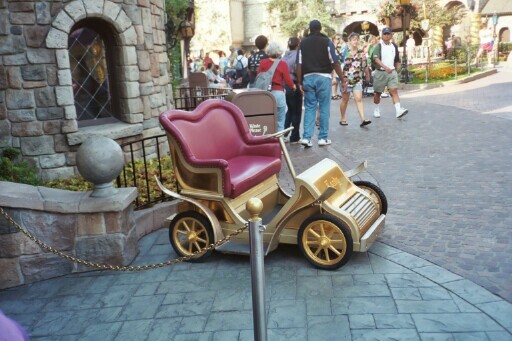 A golden auto outside of Mister Toad's Wild Ride. Another golden car ran inside. July, 2005. 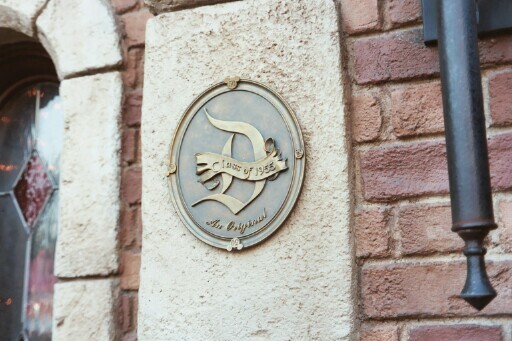 A plaque outside of Mister Toad's Wild Ride. Each original ride in the park had one for the Fiftieth Anniversary. July, 2005. A "50" in mouse ears marks the Fiftieth Anniversary, next to the drop at Splash Mountain. July, 2005. 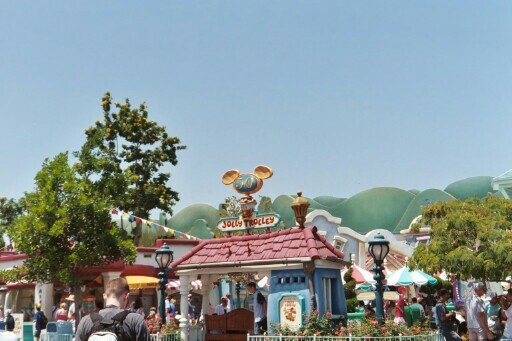 There were at least fifty "50"s in the park, mounted on mouse-shaped plaques and other backgrounds. There was a plaque by the hole in Splash Mountain. There was another on the bosom of Columbia's figurehead. There was a 50 on a spider's web that covered the front of the Haunted Mansion. 50th birthday souvenirs were on sale everywhere. 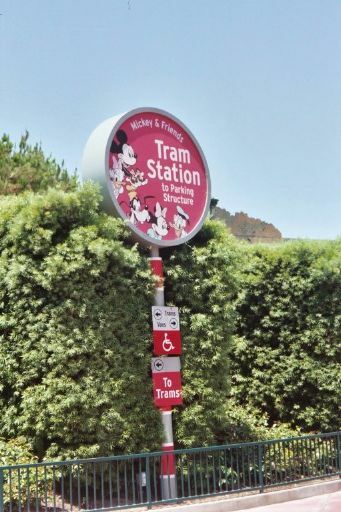 Many peoples' first ride at Disneyland is on the parking lot tram to this station near the main gate. July, 2005. A parking lot tram at the station near the main gate. July, 2005. We visited Disneyland in July, 2006. The temperatures were in the 90s and 100s and there was a thunderstorm one day. We had left our rain ponchos in the room, so we had to buy new ones. Locomotive 4 crosses the Critter Country trestle. July, 2006. We saw trains pulled by locomotives 1 (CK Holliday), 2 (EP Ripley), and 4 (Ernest S Marsh) (see 2002 for details about the locomotives). I did not see 3 (Fred Gurley) or 5 (Ward Kimball). Private car Lilly Belle, newly restored, ran behind Number 4. This year Disney restored seats on the tenders of Numbers 1 and 2. I did not get to ride there. One of the conductors said "Thank you for choo-choo-choosing the Disneyland Railroad." As we pulled out of Tomorrowland Station towards the Grand Canyon and Primeval World, another conductor said, "No flash photography, please. Our animals are already scared stiff." Newly restored private car Lilly Belle rolls across the Critter Country trestle. July, 2006. 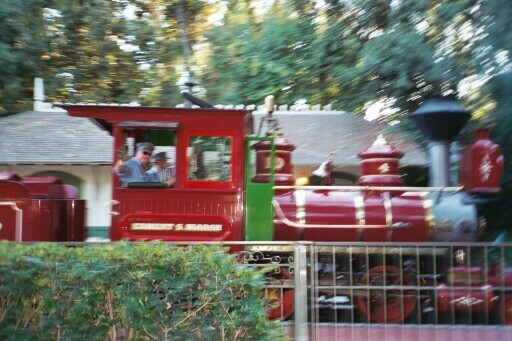 The fireman waves as Locomotive One waits to leave New Orleans Square Stations. Two passengers sit on newly-restored seats on the tender. July, 2006. 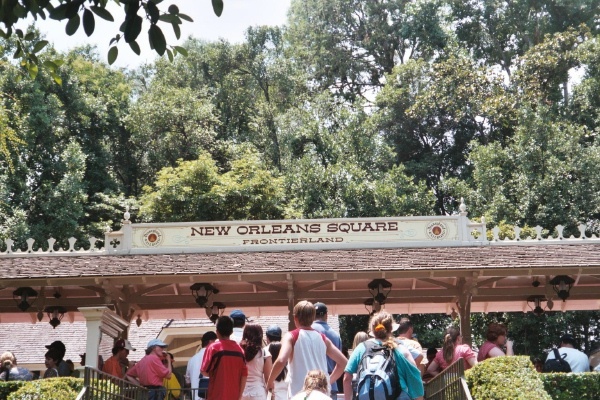 The New Orleans Square Station sign. July, 2006. Another New Orleans Square Station sign. July, 2006. 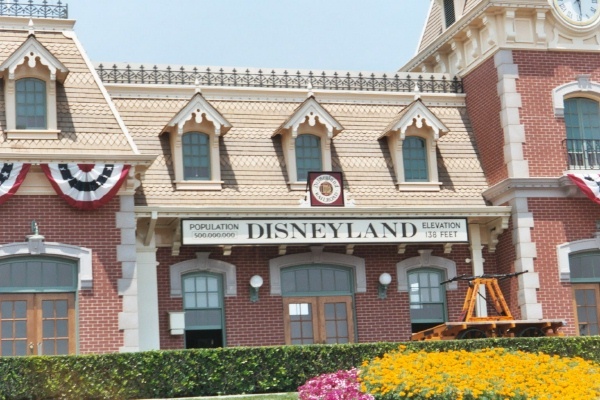 The sign on the park entrance side of Main Street Station. July, 2006. A sign at the end of Main Street Station. July, 2006. A new map of the Disneyland Railroad in Main Street Station shows the current five locomotives and the position of each train. See 2003 for an earlier version of the map. July, 2006. Locomotive 2 waits at Main Street Station. July, 2006. A horse car starts its trip up Main Street, drawn by a pretty grey horse. July, 2006. We did not see the horse cars on two days. I assumed this was because of the excessive heat. I saw horse car Numbers 1 and 2. I did not see Number 3 or Number 4, the golden horse car. 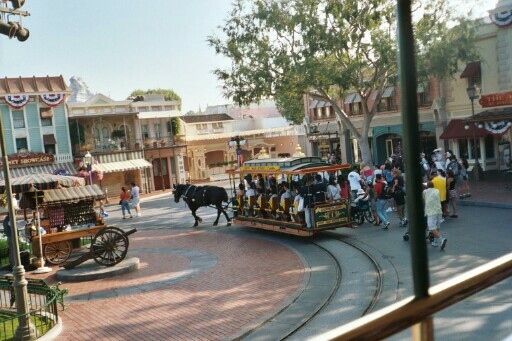 A horse car turns into Main Street. July, 2006. 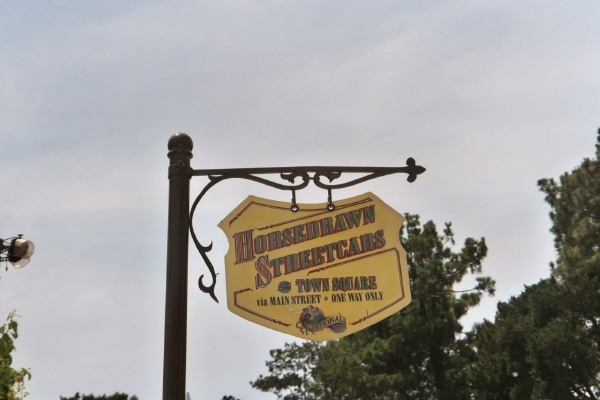 The sign at the horse car loading zone in Town Square. 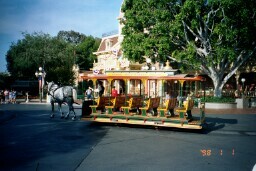 July, 2006.
horse car 2 rolls down Main Street. July, 2006. 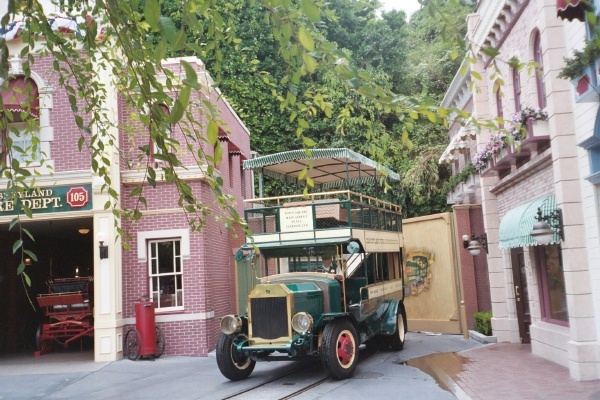 The double decker bus pulls out from the gate between the firehouse and the Main Street Emporium. July, 2006. 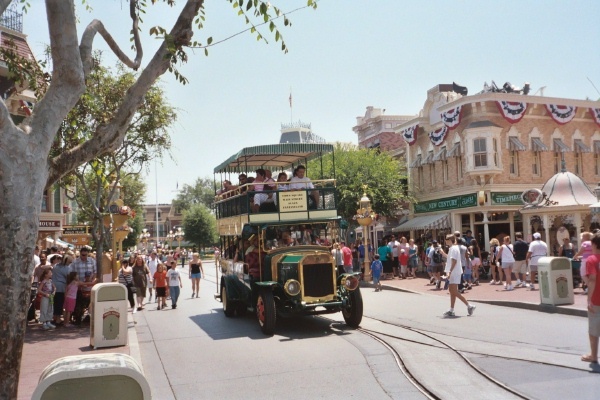 With the horse cars out of service on two days, the double decker bus and the other rubber-tired vehicles on Main Street were busy. The double decker bus rolls up Main Street. July, 2006. An automobile and a fire truck wait to carry passengers up Main Street from the station. July, 2006. 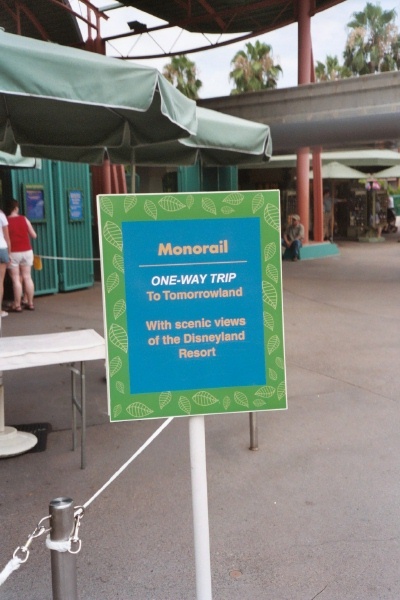 A flier given to Disneyland Hotel guests describes one-way Monorail service to and from Tomorrowland. Notice that the graphic depicts a Mark I monorail. July, 2006. 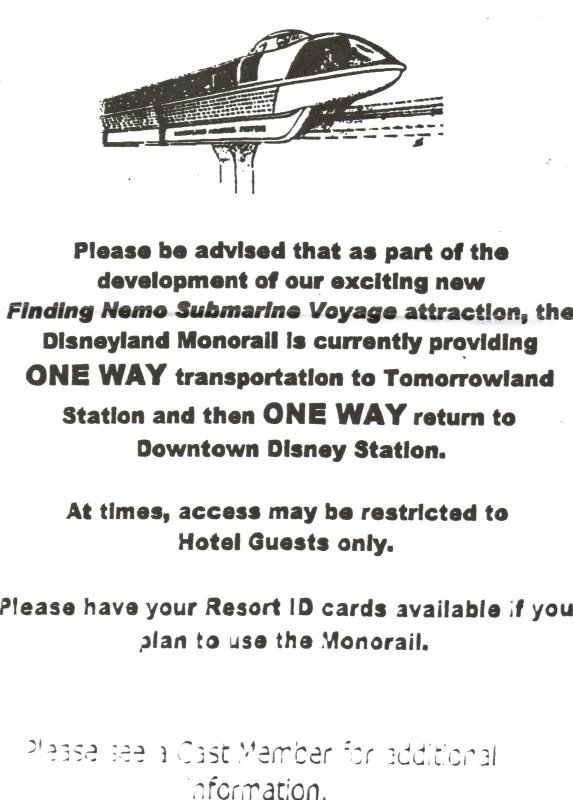 Because of work on the new Finding Nemo ride in the Submarine Lagoon, the monorails ran only on the short stretch from Downtown Disney to Tomorrowland via Disney's California Adventure. The monorails went down completely in late August. Rumor has it that they will come back briefly in late December, then be down till the Nemo ride is finished. 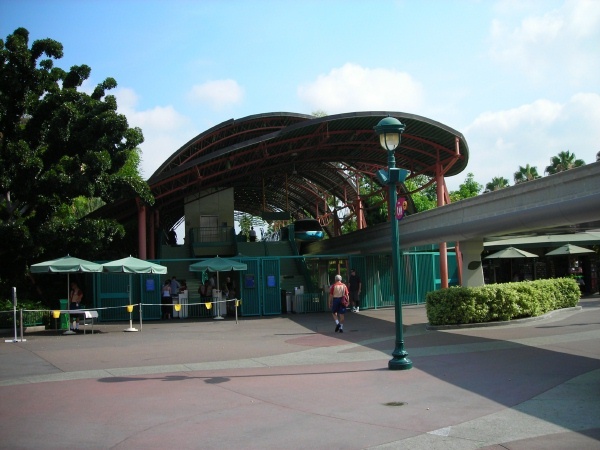 The trainsets and Tomorrowland Station are going to be refurbished. 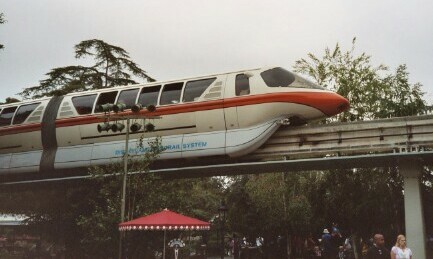 A report on 24-Dec-2006 said that the monorail was back in operation, with Monorail Red running. Monorail Blue was being refurbished in Canada. A sign at the Downtown Disney Monorail Station gate announces one-way service to Tomorrowland. July, 2006. 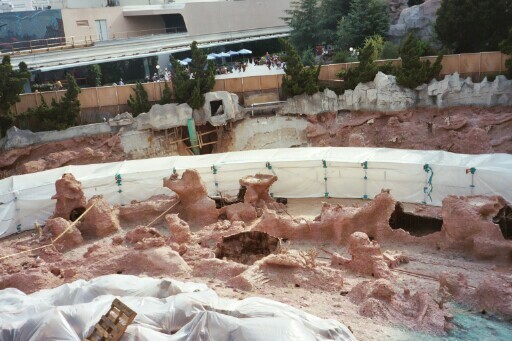 A view of the former submarine lagoon and construction work on the new Finding Nemo ride. 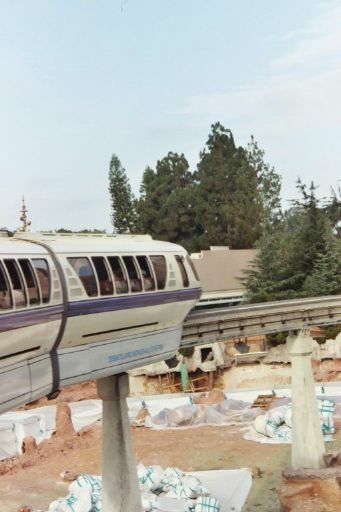 The form on the monorail track is intended to check clearance. July, 2006. 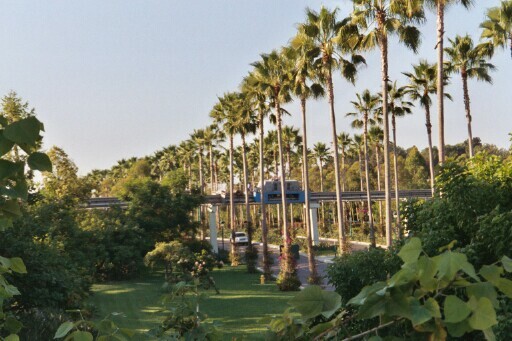 Another view of the monorail track crossing the former submarine lagoon. The Matterhorn is in the background. July, 2006. Monorail Blue, leaving the Grand Californian Hotel is about to turn towards the Downtown Disney Station. July, 2006. Monorail Blue sails into Downtown Disney Station. July, 2006. I was particularly impressed by the work of one of the Monorail crew, a young man named Alfred. He had a good patter and worked well with people. Monorail Blue lays over at the Downtown Disney Station. July, 2006. Another view of Monorail Blue at the Downtown Disney Station. July, 2006. 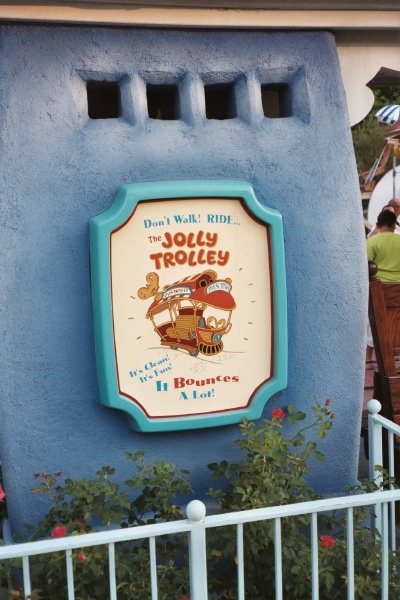 A sign in Toontown advertises the defunct Jolly Trolley. July, 2006. 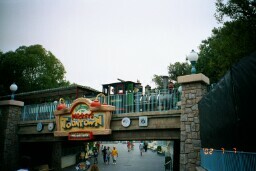 In Toontown, the Jolley Trolley was still out of service. Car 1 was on static display on the passing loop. The fire truck was missing, as was the handle on the detonator in front of the fireworks factory. Jolly Trolley Number One on static display in Toon Town. July, 2006. A view of the tracks of the abandoned Jolly Trolley, showing its former carbarn. Note the stroller parking sign blocking the tracks. July, 2006. A view along the abandoned tracks of the Peoplemover and Rocket Rods. July, 2006. The tracks used by the Peoplemover from 1967 to 1995 and the Rocket Rods from 1998 to 2000 are looking bad. 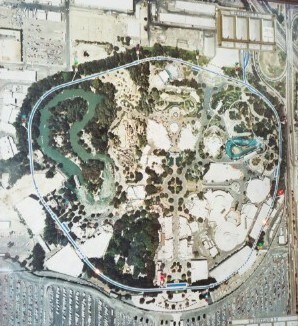 The stretch around the Submarine Lagoon and the Autopia are getting overgrown by vegetation. 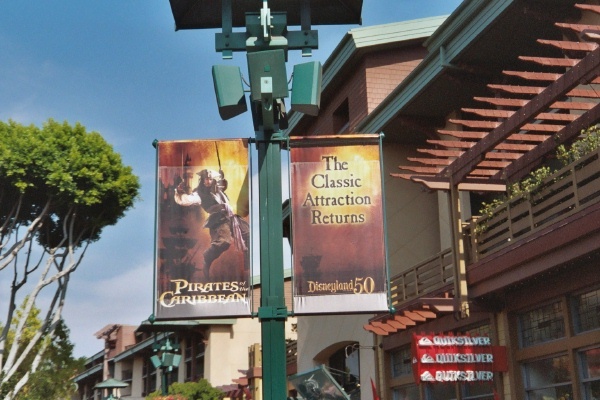 A sign advertises the revised Pirates of the Caribbean. July, 2006. 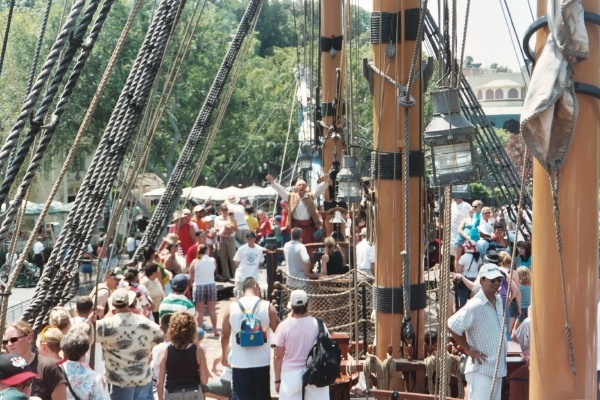 Pirates were the year's major theme, with the opening of the remodeled Pirates of the Caribbean and the second movie based on the attraction. There was a new sound system and some of the special effects in the ride were upgraded. We got a very good view of the storm scene when the ride broke down and we were stuck next to it for twenty minutes. When the ride started again, we moved on to the treasure scene and then got stuck for another tweny minutes. The ride closed frequently throughout the time we were there. Other new features included a painting of Captain Jack Sparrow by the entryway and three new figures representing Johnny Depp's character. The story changed so that the pirates were attacking the town in an effort to find him. Other pirate features included a bucaneer taking over the Columbia each trip and a band called the Bootstrappers, who entertained in New Orleans Square. A cast member dressed as Captain Jack Sparrow wandered randomly around New Orleans Square, pausing occasionally for photos and autographs. Every time we tried to join the line, his handler said the line was closed. He refused to say when and where Captain Jack might appear again. This did not help the mood of people already unhappy because of the heat. Pirates, Indiana Jones, and Splash Mountain were down repeatedly. Some people speculated that the hot weather may have contributed to the operating problems. A pirate takes over sailing ship Columbia. July, 2006. 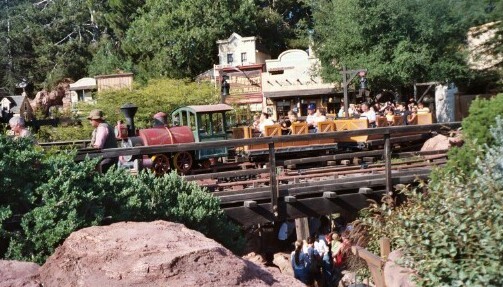 A train on Big Thunder Mountain. July, 2006. 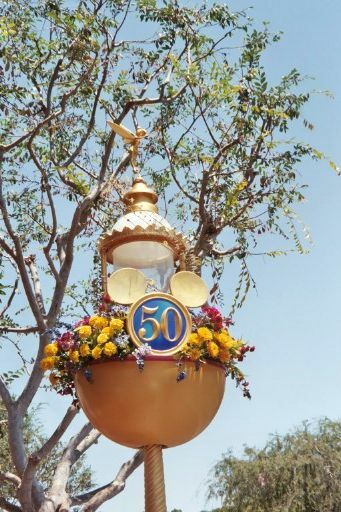 Disneyland's 50th birthday decorations were still in place. They were going to come down after Labor Day. 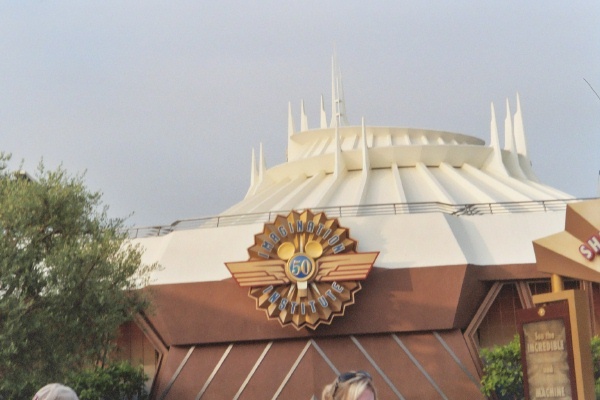 A "50" in mouse ears marks the Fiftieth Anniversary, next to Space Mountain. July, 2006. 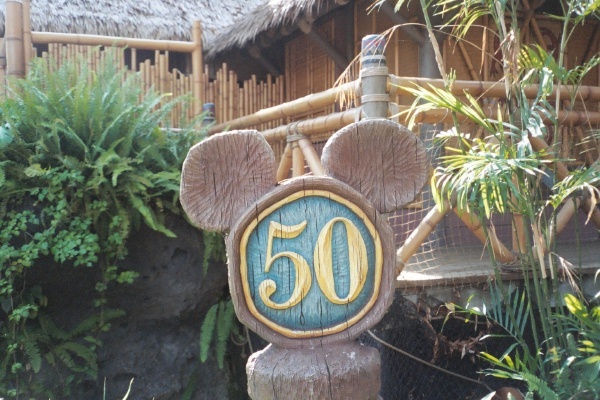 A "50" in mouse ears marks the Fiftieth Anniversary, next to the Enchanted Tiki Room. July, 2006. 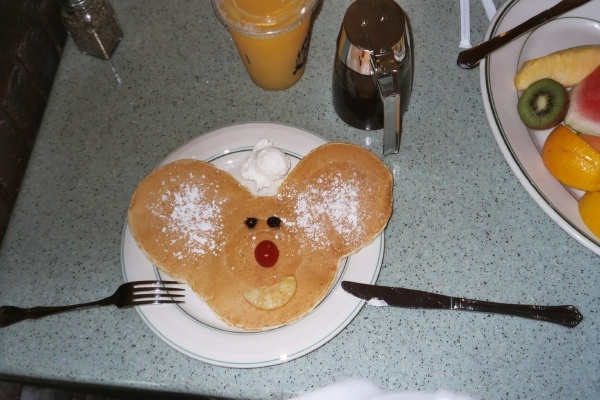 I always like to have Mickey Mouse pancakes at the River Belle Terrace. July, 2006. 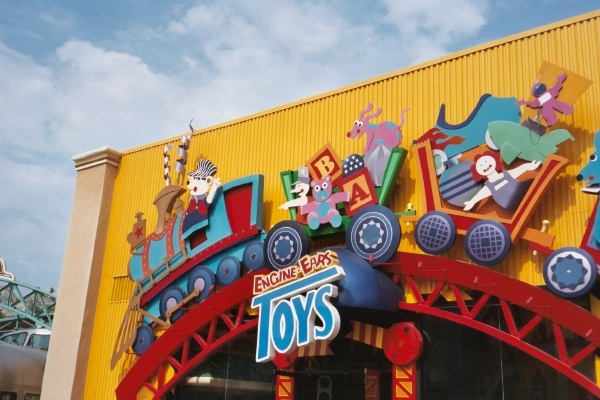 The sign at Engine Ears Toys in Disney's California Adventure. July, 2006. 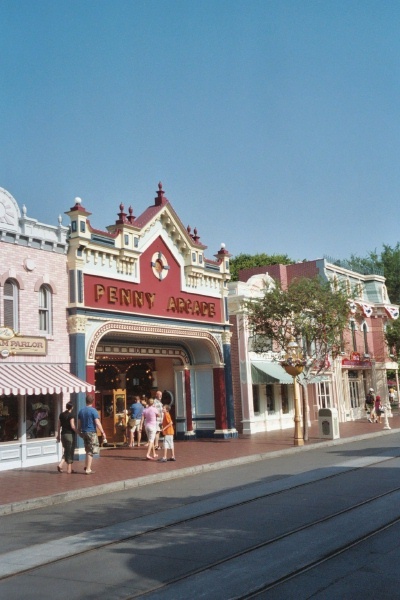 The Penny Arcade on Main Street. July, 2006. A side view of a Mutoscope in the Penny Arcade. July, 2006. 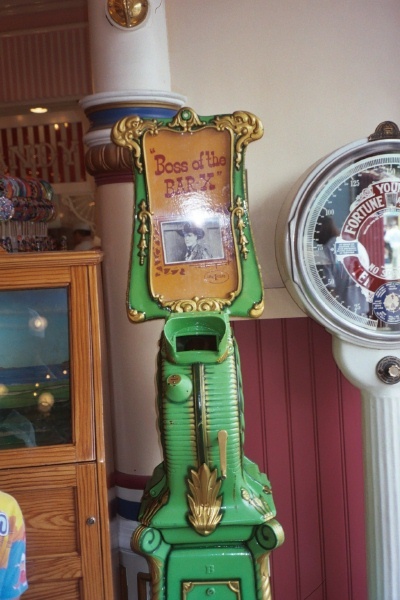 A front view of a Mutoscope in the Penny Arcade. It is showing a clip from a Selig Tom Mix movie. July, 2006. We watched Fantasmic and the fireworks from the balcony next to the Disney Gallery again. The $60.00 tickets ($47 last year), were also available for ground-level seats in a roped-off section. Here are some books that I have read and enjoyed. 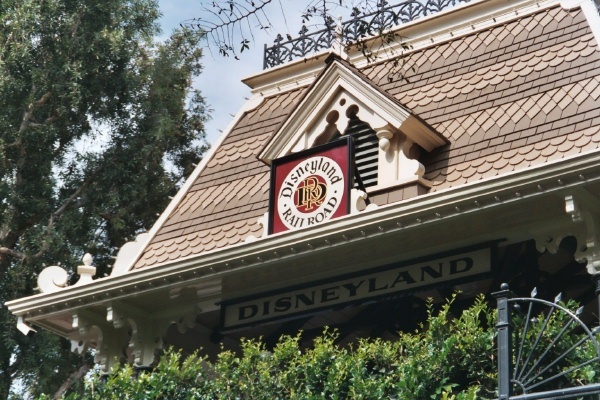 Welcome Aboard the Disneyland Railroad! I enjoyed reading Steve DeGaetano's book Welcome Aboard the Disneyland Railroad. I like the approach he chose, to describe how the railroad, especially the steam locomotives, really works. I think this is a good idea because it allows people who are not railfans to understand what is going on in the park. He explained things it took me many years to learn. The illustrations were good, particularly drawings of the locomotives by Preston Nirattisai. 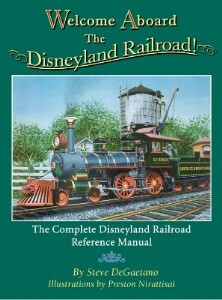 It is easy to tell that this book was written by someone who loves the Disneyland Railroad. The book is available from Steam Passages Publications. I enjoyed reading another book by Steve DeGaetano, From Plantation to Theme Park/The Story of Disneyland Railroad Engine No. 5, the Ward Kimball. I was very excited when the Five Spot joined the roster at Disneyland. This book does a good job of explaining how it got there. Steve found documentation of the original order placed to Baldwin by a Lousiana plantation railroad. He traced the story of its operation on the plantation, then its new life at Ohio's Cedar Point amusement park. 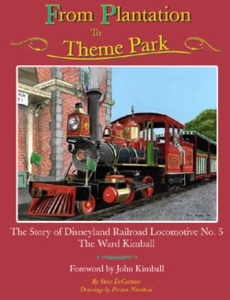 He documented the strange case of the original Ward Kimball, a locomotive which proved to be too large for Disneyland and too small for Disney World. It was ultimately traded to Cedar Point for the locomotive which became the new Ward Kimball. The best part of the book comes when Steve documents the meticulous rebuilding of the locomotive. He was fortunate to be able to participate in the work and get his hands on the locomotive. This is a rare opportunity for a railfan. Steve really makes the reader feel his love for railroading in this section. Preston Nirattisai produced fine blueprint-style drawings of the locomotive as it was originally delivered and as it was rebuilt for Disneyland. There are many fine photographs. There is also a foreward by John Kimball, son of Disney animator Ward Kimball, the locomotive's namesake. I have not yet read Walt Disney World's Main Street Horse-Drawn Streetcar by David Leaphart, but I am looking forward to it. Check his Disney World Railroads website. Steven says to potential readers: "The book is definitely a labor of love, and I hope it shows if you read it. 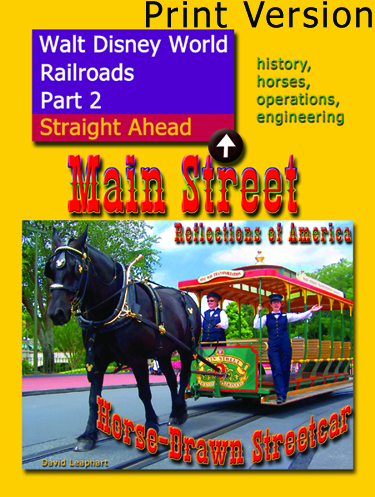 I wrote it as a journey by you and me through the story of Main Street, horses, and streetcars. On this journey, you will get to know the cast members who create the magic and the wonderful horses who make it happen. I have developed wonderful relationships with both, and these dwarf the book itself." If you are interested, you can order it through Lulu. 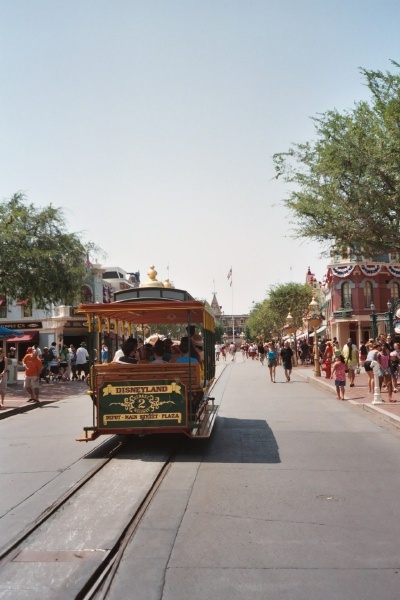 Walt Disney World's Main Street Horse-Drawn Streetcar hardcover. 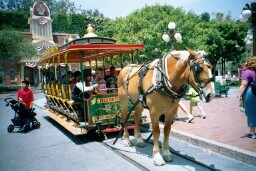 Walt Disney World's Main Street Horse-Drawn Streetcar ebook. Copyright 2002-2013 by Joe Thompson. All rights reserved.